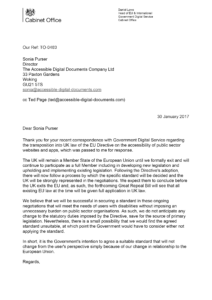 The Cabinet Office has confirmed to us that the government intends to incorporate the recently agreed EU Accessibility Directive into UK law, despite the Brexit process. Last October we posted a report about the directive, explaining how the directive aims to make public sector websites, documents, mobile devices and apps accessible to everyone, across Europe. Significantly, PDFs are specifically included in the scope of the directive. However, some office file formats, such as pre-recorded time-based media and the content of archived websites are excluded. The intention is that information contained in excluded formats will have to be provided in an accessible form on request.